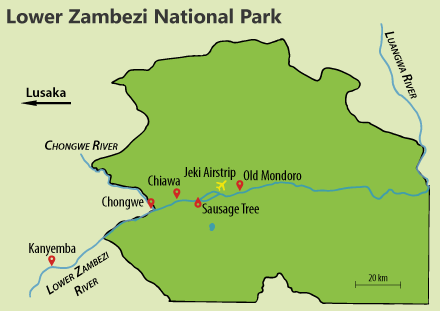 Until 1983 when the area was declared a national park, the Lower Zambezi Park was the private game reserve of Zambia's president. This has resulted in the park being protected from the ravages of mass tourism and remains one of the few pristine wilderness areas left in Africa. The diversity of animals may not be as wide as the other big parks (for some reason there are no giraffe), but the opportunities to get close to game wandering in and out of the Zambezi channels are spectacular. The diversity of activities here is also wider than anywhere else on the continent: boating safaris, canoe trips, game drives at day and night and some fantastic walking areas, not to mention some of the world’s best Tiger fishing. Our SafariDiary website (Days 1 to 10 of the Zambia (2) Itinerary) describes a significant amount of time spent in many of the camps that characterise this area, and our principal ZambiaAway website of course contains much more specific detail. So important is the presence of the mighty Lower Zambezi river, that our planned itinerary here is not restricted merely, or even mainly, to walking, but rather allows the visitor to also partake in river-based activities such as boating, canoeing and fishing as well as conventional game viewing. Hence this particular itinerary should be seen as very much an activity-based one, in contrast to the rather more sedentary one involved in conventional game viewing by vehicle. Your trip begins with a three night stay at Kanyemba Lodge, which is actually located several miles upstream from the Park itself, and is favoured since it provides exactly the same river-based activities as the lodges lower downstream, but at a much lower price. Here you can enjoy every activity that the river itself provides, in exceptionally comfortable circumstances - indeed Kanyemba is one of our favourite locations in the whole of Zambia. There is also the opportunity to include one night at their Island Bush Camp, which is a very different, but well worthwhile experience. However do not go away with the idea that the walking safari aspect is being ignored - the island on which this camp is situated provides excellent walking in itself, and will allow you to get your legs in gear for the serious walking to follow. An exciting journey downstream by boat then takes you to Chongwe River Camp, situated just outside the National Park. From here (as with all the other camps and lodges here) you can continue with river-based activities or take game drives, but our main focus here is that of walking. From here you can choose to head off in two different directions - north in the direction of the escarpment, or east, paralleling the river. After spending two nights at Chongwe you will walk further downstream to the classic Chiawa Camp, where, again, during your two night stay, you can undertake further walking, game drives, river-based activities or simply relax by the banks of the river. Continuing in the same vein, further downstream you will reach the very differently themed Sausage Tree Camp. Your trip then concludes with a further two nights at Old Mondoro Bush Camp, from where, but in very different surroundings, you will conclude your Lower Zambezi experience. The entire route is quite epic in design, as it cuts a swathe through most of the Lower Zambezi National Park, paralleling the river, and encountering every different type of vegetation and wildlife that characterises this wilderness area. As always, the actual itinerary followed can be tailored to your own wishes, budget or otherwise, but it is probably best to point out that, dependent on the time of year, and hence the state of the bush, it may be necessary to replace short stretches of the actual camp-to-camp route with a vehicle or boat based transfer. The cost of this itinerary - 3 nights at Kanyemba, followed by two nights each at Chongwe, Chiawa, Sausage Tree and Old Mondoro Camps - comes out at $10565 per person in high season. This is an example only: the actual trip could be longer or shorter.